LPS Corp. is a complete food processing equipment, supply and service company. We provide sales and service to most brands of food processing equipment, a complete line of rebuilt equipment as well as a full selection of expendable products to prepare your food for distribution. 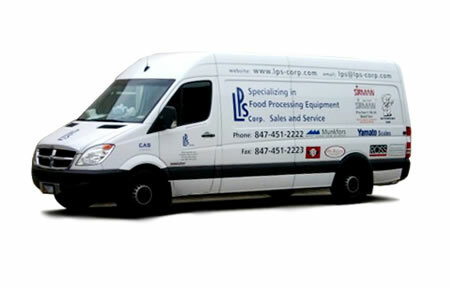 With owner/operator Luigi Pintore at the helm, LPS Corp has combined old-world standards for customer service with modern equipment to become one of the fastest-growing purveyors of quality food processing equipment, supplies and service in the Chicagoland area. Since establishing LPS Corp. in 2005, Luigi has demonstrated his strong European work ethic, built upon thirty-five years of experience in selling and servicing food processing equipment throughout Europe and the United States. Our pledge to our customers is simple, to provide you with the best food processing products and supplies available at the fair price, backed by unmatched service. LPS is committed to keeping on top of the latest trends and developments in the food processing business so that we can bring you the absolute best in equipment and products available. ©2013 LPS Corp. All rights reserved.